GRAND RAPIDS February 26– Michigan’s March 8 election is just around the corner, and in addition to the high- profile presidential primary that day, there’s also a very important state house seat on the ballot. 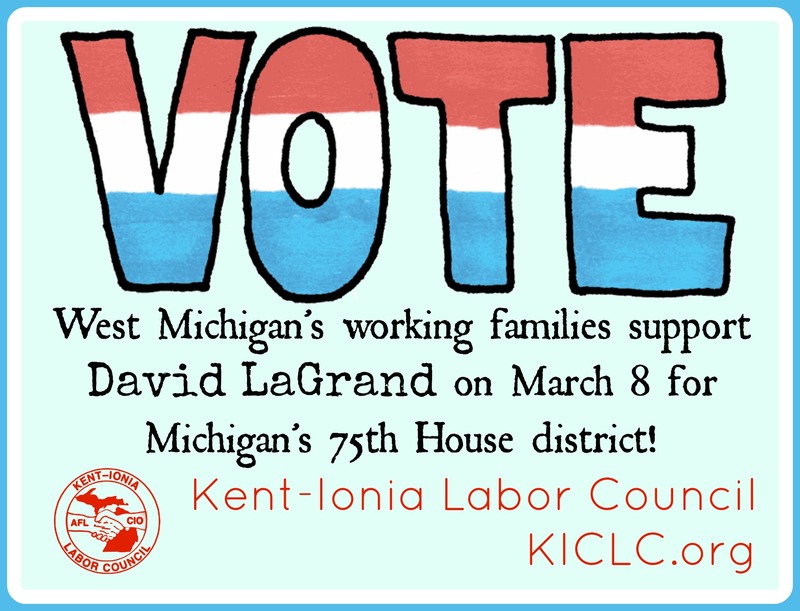 Michigan’s 75th house seat is vacant, and we need to make sure David LaGrand wins this seat. Whether or not you live in the 75th, we need your help making sure David LaGrand is elected to this seat. We can’t afford to have another anti-labor politician working against us in Lansing. If you’re able to take a shift or two, email Steve Veldheer at Steve@KICLC.org. This entry was posted on February 26, 2016 by WMALC in Political news and tagged David LaGrand, GOTV, Grand Rapids, KICLC news, Lansing.